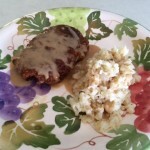 Delicious low carb chicken fried steak and gravy! Lower heat to medium-low for 2 minutes until the mixture has thickened. Because this gravy doesn't contain large amounts of milk/cream or flour, it will be a golden color rather than cream colored. More heavy cream can be added to lighten the color if desired.